Guess whose back? Like any annoying pest, once I get myself into something I’m hard to get rid of. Allow me once again to monopolize your time and tell you about the awesome adventure that we had last week. Be warned it contains spoilers but if you don’t know what happened at the NCAA South Regional by now, to be quite frank, you’re slacking. As a Brit I learned many new things this weekend. I learned there is a place called Prattville (unless you are British you probably won’t get why I found THAT so funny). I learned that no matter how many times you say, “Howdy” to athletic trainer Armand Daigle he will never say it back. And I learned that the Florida State women’s cross country team has more guts than even I knew. The road leading to regionals had been full of unforeseen twists and turns. We have had niggles, multiple falls on trails and workouts that reduced us near to tears. We have been shouted at, beaten down and we have collectively had more ice baths than should be considered legal. Individually, we had all had good performances at one meet or another but we had failed to put them all together on the same day. We were jigsaw pieces that just couldn’t fit to make a clear picture. We had a disappointing performance at ACC’s and the heartbreak that occurred there still lingered. 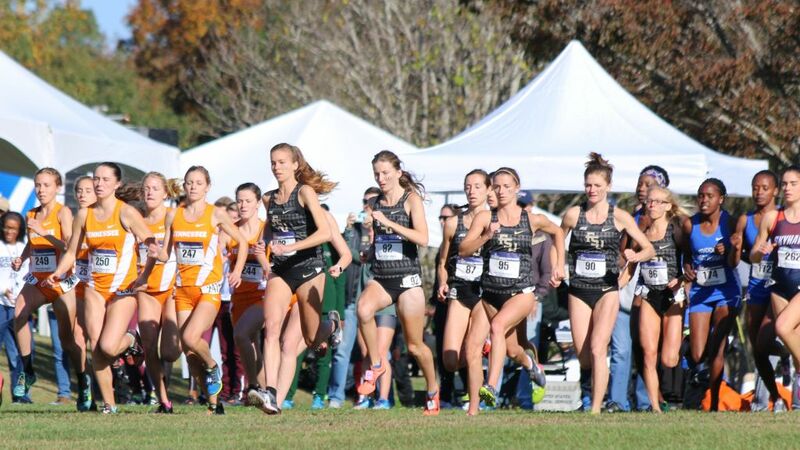 There was only one thing for it – we needed a cross country rebound at regionals. So it was with butterflies in our stomachs that the FSU women’s cross country team turned up to the Alabama cross country course. It was the big one; the only meet that counts. It was the meet we had been preparing for. The meet that months of workouts, 6 a.m. starts and trying (and failing) to eat healthy, had led to. A lot of us (me included) had already started feeling the end of season blues, but thanks to the healing waters of the ATR ice tub and the healing super powers of Armand and Danielle Fernandez we had put ourselves back together best we could and were ready to battle. It wasn’t going to be pretty, of that we were sure, but it was going to be the best we had. We had one instruction. “Get out hard and give it your all.” And it was with these wise words from coach ringing in our ears that we toed the line for the last time of the season. The gun went and the battle began. Due to being otherwise engaged I am unable to give you a play by play of what occurred on the course but I can tell you one thing, we fought hard – harder than we have ever done before. One member of our team saved her best for last and crushed it. My favorite sassy senior Emily Edwards not only PR’d but also got all regional honors, an achievement she couldn’t have deserved more. A key part of the glue holding the team together, she gives wise words to all the freshmen, making them feel slightly less terrified and also uses a level of sarcasm that I find awfully refreshing. It is sad that this race was her last cross country race, but at least she finished on a high and as a team we couldn’t be more proud of her. Now that I’ve finished embarrassing Emily let’s get back to the team. How did you do, I hear you scream. Well we finished with a total score of 129 and that was good enough for fourth. It may not have been the result that everyone wanted and if this was a Hollywood movie it would end with Morgan Freeman telling us that we had somehow made it to nationals through some magic loophole. However, unfortunately this is not a movie and so this is where our cross country season ends. Yet no one on our team was disappointed with our effort because we all know that we had gave everything for each other. Even coach was happy and you have no idea how rare that one is. Only kidding. She’s a teddy bear really, or am I just saying that because I fear her snarkiness? You will never know. So we may not have made it to nationals but we gave it the best we could. We believed in the training, we believed in ourselves and we believed in each other and from that we came away with a performance that we can all be proud of. So that is it from me until next cross country season. I hope you have enjoyed my chaotic blogs as much as I’ve enjoyed writing them. Go Noles! 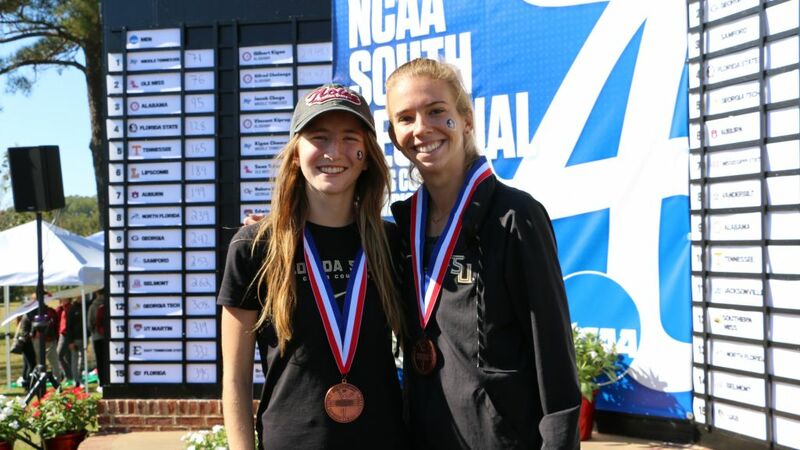 Florida State freshman Jodie Judd, from Canvey Island, Great Britain, volunteered to take a crack at the weekly women’s cross country blog. Not only has she been one of the standouts on the team this season, her endearing personality and humor shines through in the written word as well...And Jodie’s modesty prevents her from mentioning that she finished 10th at the South Region meet, tops among all Seminole women (and men), and just four seconds shy of qualifying from the NCAA Championships. Judd was the second-fastest freshman in the field.